Oh dear, the Union is looking decidedly rocky right now. Opinion polls at the minute have the Scottish Nationalist Party in the lead going into Thursday's Scottish election and, as if that wasn't bad enough for pro-Union types, a recent poll has shown support for Scottish independence to be much higher among the English than the Scots! So it's not only in NI that pro-Union folks are failing miserably at promoting the benefits of the UK, but also in England and Scotland as well. Beautiful! It may make for bleak reading for unionists but an ICM poll published in the News of the World showed 56% of the English surveyed believing it was now time to end the 300-year-old Union, compared to 41% among Scots. The ICM poll revealed a majority of English oppose higher spending on Scottish households and votes for Scottish MPs on English-only issues. English voters are also unhappy with the constitutional right of Scottish lawmakers to continue to vote on English issues at Westminster, whilst their English counterparts have no say on policies in Scotland. The SNP have promised a referendum on Scottish independence if they win the majority of seats in the 129-member devolved parliament in Edinburgh. "Although he prefers maintaining the union, the DUP MP hints that, in the very long term, maybe an independent Ulster could take its place in a future Europe of small nations." Hmm it's almost as if anti-Irishness is at the heart of Mr Campbell's beliefs rather than a commitment to the Union. Fancy that! 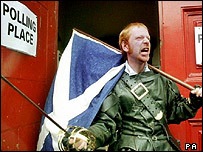 "But the combination of Scottish nationalism on the march and the English beginning to assert their slumbering sense of identity means that, in the future, unionists may have to come to terms with some changing political realities across these isles." Absolutely right, Mark. This changing political reality will involve a move away from the United Kingdom and a move towards a United Ireland. I urge the Scots and the English to follow our lead and to put that pathetic political entity, built upon bloodshed, deceit and greed, out of its damn misery forever.